Efficient version reduced production cost and lower prices ! Is it really Astral is the best and less costly Astrology Software ever produced? Don't miss the chance of having this software working for you. Enjoy the wonders of the Key Cycle and Primary progression. It calculates and shows everything you need . . .
1) Horoscope (Chart, Wheel, Map ...) construction: The phase "Horoscope" refers to a diagram showing the state of heaven at particular moment. more ShowMe. Its purpose is to remind the astrologer where the planets were at particular moment in the zodiacal signs (showing their longitude degrees between 0 Arise and 29 Pisces) and how they are seen from the earth (not from the Sun) scattered around in the 12 hypothetical divisions (Houses). First what one sees in a Horoscope is a circle and twelve divisions inside. They are called the Houses. Each of them confines a particular life activates. The Horoscope is rather organized instrument but in rather tricky manner. For the beginner, it is sufficient enough just to know the elementary significances about each house. Working with Astral software, the user get more hints about each House as well as the planets and the zodiacal signs. For example: the 1st House refers always to the Native himself and the physical body. The second Houses goes to his finance, income, accumulated wealth and as such. The 3rd House related to his commutations and his brothers and sister and so on. The 4th House for his place of living and real estates, while the 5th often refers to his pleasure and speculations and so on. Tons of books are written about these topics and a lot is available on the net for free. Most prediction tools require up to the minute accurate birth time. Often, even well documented birth time need to be astrologically rectified to affirm some relevancy between few major life events and primary progression. Calculating primary progression directions is uneasy task even for professional astrologers which makes "birth time rectification" among the most expletive services offered by astrologers . Astral Astrology Software is designed to help you as well as the professional astrologers to do all such calculations with incredible accuracy and flexibility. You need only to know the exact date of some major life events and some preliminary perception to attribute which of the events to which primary direction according to the nature of the event and the corresponding nature of the progressing planet. With correctly recorded and rectified birth time. Primary progression is expected to reflect faithfully all major life events. Calculating and listing primary direction is very tedious task due to the various variants used in the calculations. Astral Astrology Software has solved all those problems making the calculations with the various options very easy and fixable. Experimenting the various "Time Measure increments" , Planets directions "With or without planet's latitude", "Zodiacal & Mundane plants positions" as well as "Directions to natal Angels" and altering "Birth date and time" all could be fixed very easily. In this way you can watch the changes in the chorological listing of the calculated directions immediately on the same page without any additional efforts. It is the second column of ancient astrology and still considered so among many modern astrologers due to fact that few minutes inaccuracy in the time of birth may not change considerably the date of life event occurrence attributed to the secondary direction as in the case with primary progression. Astral Astrology Software offers you the possibility to alter the birth time by any amount during the calculation and see immediately the changes in the chronological listing of secondary directions. Lunar secondary directions are also available. All could be done with maximum convenience as you can filter out and in any directions you would like to see or print in the listing. All astrological predictions observe the location of the transiting planets in any chart. Astral Astrology Software helps you to do that in several ways applying various options only with few clicks. Transiting planets passage over natal planets and through natal houses could be seen graphically a wheel (The Transiting Chart) and in chronological listing in tables for the dates when such transits take place. You can alter the birth time minute by minute to see the changes in the date of the transit. With single click you can see the next/ previous day transiting chart from any date you wish to start with. It is possible to alter the span of time between charts from one day to any number of days to see the effects of transits on the nativity for endless period of time. Also, you can see any defined aspects (by you according to your need) casted by the transiting planets on the nativity inside the wheel as well as in separate listing with the exact amount of orb in degrees and minutes. That could be very helpful to adjust the time of birth according to the dates of previous major life events and major transits in birth time rectification. It is the greatest discovery of the twentieth century Astrology. Everyday transiting planets are of global nature, they affect everything, everyone everywhere. The question is how and when do they affect you and him and her? Traditional Astrologers try to find the answer form the transiting planets passage throughout the Nativity (natal chart) of the individual. This method is very good one but it covers events occurrence in broad manner that means it is not sensitive enough to cover the detailed daily events so as the Key Cycle chart does. Why? 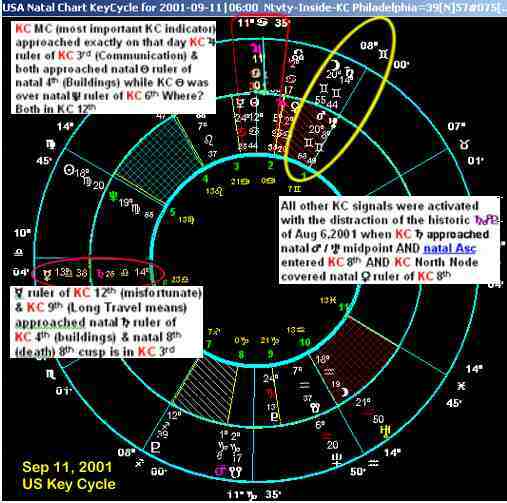 The KC chart is natural continuation of the Nativity of the individual to the present time and place. It shows your nativity as if you were born now and at your present location. The natal mid-heaven is the most important point in individual life and it remain sensitive till one ends life. KC mid-heaven is exactly so important and even more because it is dynamic daily movement and draws the attention to the field of life in which it falls, namely in which radical house it passes. Therefore, the Key Cycle operates as active radar sees in advance what is around of events even before their occurrence. The Key Cycle is dynamic chart with normal houses cusps in slow daily motion circling the Nativity with the usual transiting planets inside as its own planets. 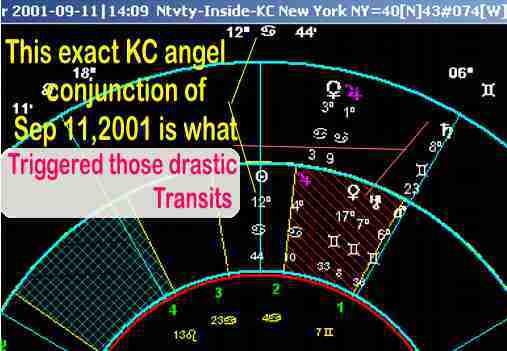 The passage of KC angels over natal and transiting planets and natal cusps is extremely significant in triggering events. KC houses passage over natal houses highly activates the nature of those houses mutually. Astral Astrology Software did enormous efforts to facilitate the presentation of such mutual relationship between the natal planets and houses and those of the Key Cycle in a way that the user can grasp quickly all the signals hidden behind the seen. 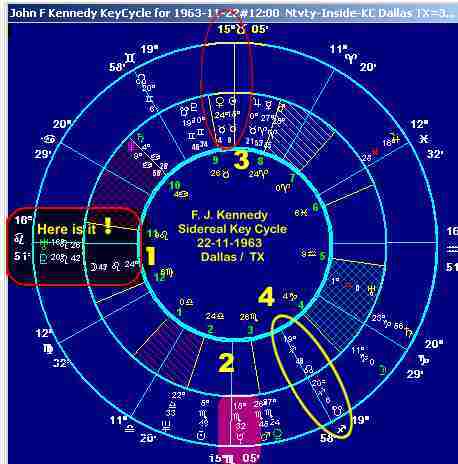 Visually in mutual wheels the user can see how the Key Cycle houses and planets interact with the nativity and in readily calculated listing the dates when Key Cycle angels pass over natal and transiting planets and cusps. It is part of heliocentric astrology options available with Astral Astrology Software. The Software has developed carefully this type of Key Cycle as well as the other two types below as it proved to be very indicative in mundane and financial astrology analysis. With the heliocentric chart, it is also possible to have in separate table chronological listing for the dates when the heliocentric planets passed over by the moving angels of this Key Cycle to trigger events. You will find constant correlation between some of these dates and the major turn over in the direction of the market. Your record of prior market reaction to particular passages will help you comfortably to anticipate the direction of the market in the future. It is new type of Key Cycle based fully on the sidereal zodiac. Often is used with eastern astrology principles to show important additional information not found in the usual Key Cycle. It is very useful component in personal and any mundane chart analysis. It exposes what could be hidden or concealed in the usual Key Cycle. You will find enormous help in it whenever you would like to go deeper and deeper in the analysis. It is another new type of Key Cycles where sidereal planets are used on tropical houses cusps. There is no theoretical principle behind it. Simply it showed effective results in personal astrology; it showed what the usual Key Cycle falls short to do for technical reasons. In has been tested in hundreds of cases and proved to be indispensible to supplement the investigation with the traditional Key Cycle. You will lots of help in it whenever you can't find what you are looking for in the usual key cycle. It is very flexible compound wheel for the horary (transiting) planets with the nativity ring inside showing any selection of mutual horary aspects or aspects casted by the horary planets on the natal bodies. It is supported with special function to help Horary Astrologers. The wheel can update itself automatically every minute showing fresh state for the heaven at that time. There are many other facilities such as manual auto updating for any defined time interval; forward and backward, full aspects orbs definition, exact mutual planets and moon aspects listing. Many special functions are designed to help researchers in this field among them picking and listing the searched global planetary aspects in very effective ways as well as timing the dates when the planet changes the zodiacal sign it is passing through. The software helps the user to have full control over the selection of planets searched and selecting any the aspect degree casted between them. You have another helpful feature by conducting special search and listing for the exact time when the Moon enters and leaves the first horary house at any geographical location you like and the date and time of the New and Full Moon to help you in election astrology to avoid ominous starts in any action or enterprise. Mundane Astrology studies the global planetary configurations (aspects) to anticipate the general social and economic state on earth and earth resources. Also the studies may be more specific about certain States and Cities whose Nativities were known. Human research in this field is very old and many of world important places have their Nativities erected and well rectified. Astral Astrology Software with the mentioned tools helps the researcher to trace and analyze the planetary configurations not only for predictions making but also for keeping lasting records and documentation. 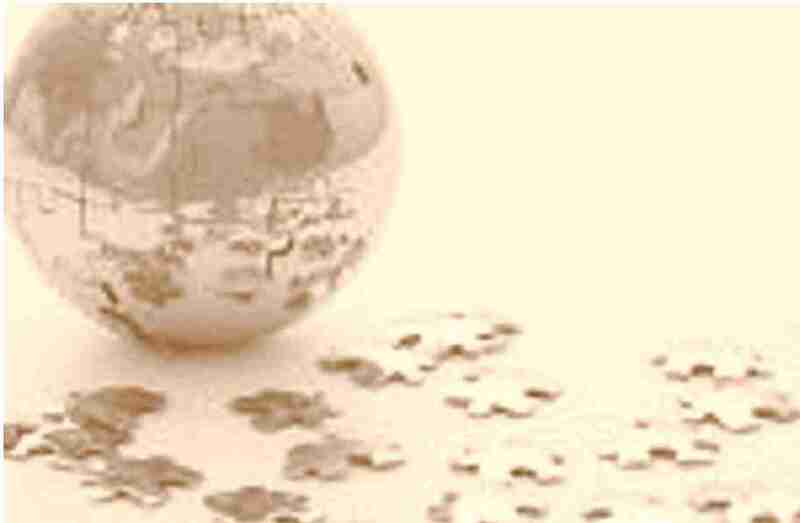 For Financial Astrology enthusiasts there is special search for selected global phenomenon and planetary aspects. Astral Astrology Software has its own selection of such items which proved to have direct impact on the global economic cycle. They are the result of long scientific and statistical researches conducted by outstanding financial astrologers in many parts of the world. Their works are published and well documented to constitute the foundation of scientific financial astrology without any myths and such like. 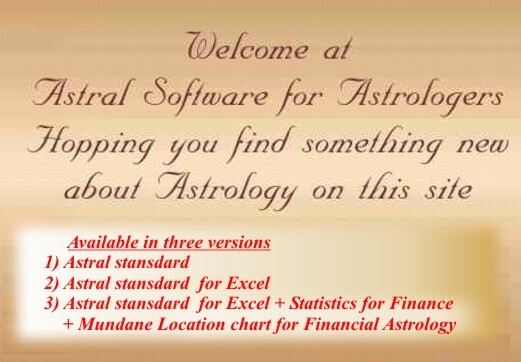 For the serious users Astral Astrology Software offers widely the possibility to extend in the research by conducting special search for any aspect between any pair of planets over any period of time and comparing it with the fluctuation in the diagrams of stocks or prices of particular goods published. It is annual chart, as the Sun turns round the zodiac once a year, the chart get erected when it approaches its natal position in the concerned Nativity. The chart summarizes the general tendencies for the coming year. Many people visit their Astrologers once a year mainly to have this chart erected and explained to them. Astral Astrology Software offers the possibility of erecting it for the place of birth and for any other location as there is strong tendency among astrologers that the local Solar Return chart (for the place where the native is found to be at that time) is very effective and cannot be overlooked. It is projected as compound chart with the nativity inside to see clearly the changes in planets movement around the houses which helps you a lot in interpreting the chart. Heliocentric calculation affects the positions of the planets in the wheel. Though, the traditional geocentric astrology is still holding ground firmly, we find lots of modern astrologers are sharing the pleasure of having their works and predictions based on the heliocentric planets positions in mundane and in natal astrology as well. Leaving the conversion between the two systems undone could be considered serious gap in any astrology software. This Astrology Software facilitates such conversion in single click in any chart just to keep the process of contemplation fluid without interruption. In fact it is primary motto of Astral Astrology Software to make the erection of charts and all the calculations to run smoothly with the utmost flexibility. Please enjoy it with our pleasure. You may be interested now to put the above mentioned tools in comprehensive framework to foresee what is waiting you in the near future or to find some explanation for unexplained experience you have witnessed in the past. However, you should have some knowledge about the nature of the planets and the zodiacal signs and some other important principles of Astrology. 1) The best thing to start with is testing the accuracy of your birth time record with the techniques of primary progression. Try to rectify it to the most probable minute which gives such natal 10th house cusp (Mc) that applies with at least few major life events. Astral software offers you unique methods for birth time rectification you need only some knowledge about the nature of the major life event you have selected for the rectification and the planet involved. 2) With the rectified birth time you can calculate your primary directions for the period you are investigating (say 5 years). Listing for the calculated directions with their estimated dates will appear in a small table. During the calculation you can adjust the time of birth to see the effect on the estimated dates of the progressed primary directions. The software also offers you flexibility to alter the increment called "Measure of Time" used in converting the arc of primary direction into years and months form the date of birth. It is better not to take the exact dates of the directions as indisputable dates for coming events due to the fact that birth time records are seldom accurate. At this stage, just accept the directions as general tendencies may cause this or that kind of events some when around the date of the primary direction. 3) It is good practice to calculate your Secondary Progression directions for that period as well. In fact with Astral Software you find them automatically are calculated together with your Lunar secondary directions only you need to adjust your selection of which planetary directions you would like to see calculated and listed in the configuration part of the software. According to the old masters of astrology as Alan Leo, with accurate and well rectified birth time Secondary Progression directions should supplement those of the Primary Progression and not contradict with them attributing that to the karmic nature of astrology. 4) You may proceed now with your Solar Return Chart calculation for the year you are investigating and at the geographical you were living at that time. You can adjust the geographical longitude and the latitude for the place of Solar Return calculation at the spot and you can compare how it looks like if it were calculated for the place of birth or any other place. It has been mentioned that in accord with serious astrologers advice the Queen once preferred to have her Solar Return far away from her place of residency so they fixed the date of her visit to south east Asia to take place during her Solar Return day to avoid some events if she were in her place of birth. 5) It is the right time now to consult the Key Cycles. You may have heard till know only about Wynn Key Cycle. In fact Astral Software has developed for you four other types of Key Cycles all within the same framework of the original one, that means they are subject to the same methods of interpretation but differ in their calculations methods. You find below how striking they operate. Concerning all Key Cycles, the cusps of the 10th house (Mc) and of the 1st house (Asc) of every Key Cycle are the most sensitive points. They are like two hands showing you what you should pay attention to on particular date. On the day of birth both the natal Mc and the Mc of the Key Cycle are identical. Soon after that the key cycle Mc and the remaining 11 Key Cycle houses cusps start their endless journey around the Nativity. It is sufficient for the beginner to follow those two cardinal Key Cycle important cusps in their motion in the zodiac. Natal houses so as natal and transiting planets will be highly activated during the passage of these points over them. The Software worked out for you unique methods how to observe this phenomena. a) You may watch the Nativity in its traditional ring with all natal houses cusps around it and the Key Cycle houses and the transiting planets moving inside. With single click you can reverse the rings, The wheel of the Nativity goes inside the wheel of the Key Cycle. In this way you can see how the planets and houses cusps are rising and culminating over the Key Cycle cusps. Without any efforts you can change the houses system and even the zodiac from tropical to sidereal and one can alter the time of birth during the operation to see the effect of the changes on the wheels. Moving the date of the calculated Key Cycles forward or backward in days or weeks or months or any period can be done with easiness and flexibility. There are many other features to provide the researcher maximum comfort. b) You might be interested to concentrate on the behaviour of the Key Cycle Mc and Asc to see exactly the date when a transiting or natal or even progressed planet passes over one of them. The software is ready for this important option. Immediate listing will be calculated and presented within seconds with the possibility to see a wheel for that date in single click. Such listing in four columns table is found to be very helpful and it could be of course printed and kept in your dower for future use. In fact all these facilities are the accumulation of decades of research and development with Astral Astrology Software to serve perfectly all the needs of astrology students and researchers. Seldom one needs any other assistance once having it installed, as all the major and important operations in astrology are done with high speed and flexibility. The Hey Cycles are well applied in Natal Astrology (for individuals) as well as in Mundane Astrology (for cities & global events). Here we see the sidereal Key Cycle which is developed as the above Heliocentric Key Cycle by Astral Astrology Software. It is the case of the most beloved US president is taken as random case study. His assassination was very obscure event. It was obscure even to the normal and heliocentric Key Cycles. Only the sidereal Key Cycle showed clear cut to the event occurrence in his horoscopes. The power of reflecting this event with this type of Key Cycles has exceeded all expectations in its accuracy and its meaning. The four signals marked on the image on the left are never ever expected to come together on one day. Indeed it was the day of the tragedy. No other existing prediction instrument managed to reflect that event with such accuracy. 1) The Key Cycle kept its power in reflecting events faithfully even with thousands years old Nativity. 2) The Key Cycle has operated with such old Nativity in a little bit different manner as it used to do. It has gathered the astrological fingerprints those of two days earlier to the exact date of the event together with those two days after the event to have the final event on its actual date on 2005-07-07. Two days earlier the Key Cycle MC passed over the North Node (Rahu) remembering its extreme malefic nature in eastern astrology. Also, 2 days earlier both the transiting Mercury and Venus passed over the Key Cycle Asc. While 2 days after the event those 2 transiting planets passed over the natal Mars. On the day of the event those two were exactly on the cusp of the natal 4th house (of local affairs) and what is most important on the day of the event the Sun covered completely the natal North Node in the Key Cycle 12th (of tragedies). The details are discussed on other pages, it is worth mentioning these features of the Key Cycle and it can reflect not only great national events. Solar Return chart has become indispensible tool to many modern astrologers today. It has a lot to add to any prediction. For example the SR chart of John Lennon for the year of his assassination is very good example how this chart is influenced by the geographical location where the individual is found on the day of his annual birthday. Lennon was born in Liverpool, lived in Los Angels and killed in Ney York. His Solar Return chart for the place of death was the most impressive one. It confirms the old astrological concept of the high importance of the place where the Native is going to spend his birthday. With the software it is possible to explore the high significance of this chart in various ways. There are the sidereal and heliocentric solar return charts. They add enormous information for the nature of tendencies one may encounter in the current and coming years. Lunar Return chart is monthly chart for the time when the transiting Moon passes over the exact degree of the natal Moon every month. The place where the individual is located at that time showed to be rather significant. The case of John Lennon confirmed this assumption as shown on the other pages. The high elevation of the Moon (on the left) and being the ruler of the 4th lunar return house (end of life house) is not good omen especially when the lunar return Ascendant fall in his 8th house just above the natal Uranus (sudden death) which was in exact opposition aspect with the transiting Uranus. Shortly speaking it is useful chart reflects the emotional mode of the individual during the month which steers particular type of events. With the software it is possible to calculate the chart swiftly for any location where you are expected to be. With some practice one can find lots of information for the coming month.